Local business listings and review site, Tipped (“where people like you and me write reviews about the places we've been”), is to host the inaugural Tipped Chilli Cook Off this Saturday the 25th from 1pm at The Mucky Pup (39 Queens Head Street, N1 8NQ) near Angel Station. 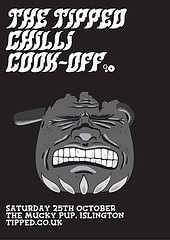 The event will pit about ten amateur chilli cooks (mostly Tipped users and food bloggers as well Tipped’s CEO) against each other as attendees rate the bowls o’ beans and award one lucky cowhand with the title of best tastin’ chilli. Hot damn. DJ's will be playing a mix of southern soul, country twang, 80's redneck rock and later on some Van Halen treats. Hot diggity damn. Yes Londonist will be there (and may even be represented in the contest). Y’all are most certainly welcome to join in the festivities too. The event is free and open to the public. But hold on there just a galderned minute, whippersnapper, capacity is limited. To ensure your entry sign up at Tipped or its Facebook page.